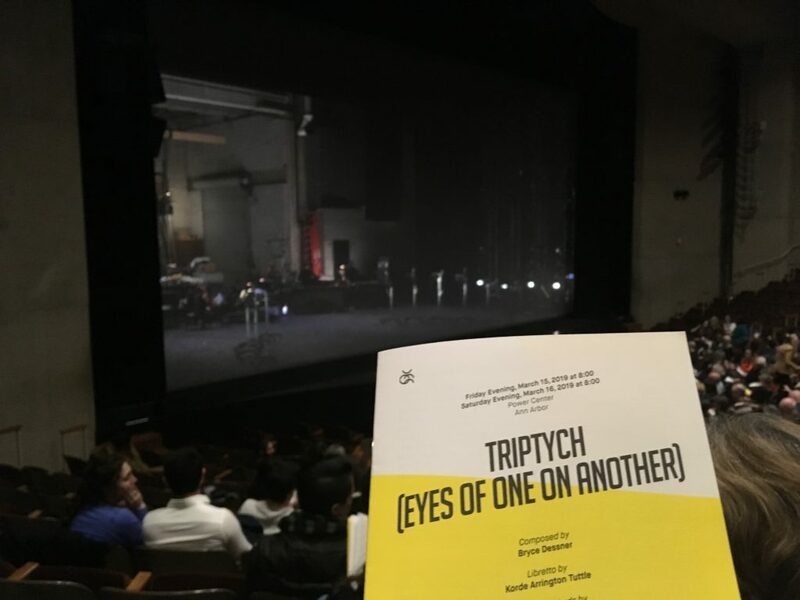 On Friday and Saturday night, Ann Arbor had the privilege of experiencing a radical new work, the culmination of a massive collaboration drawing on the talents of composer Bryce Dessner and vocal ensemble Roomful of Teeth, to theatrically mount the photography of the late and highly influential 20th century photographer Robert Mapplethorpe. “Mapplethorpe produced images that simultaneously challenged and adhered to classical aesthetic standards: stylized compositions of male and female nudes, delicate flower still lives, and studio portraits of artists and celebrities.” Using original music coming from 10 voices and a chamber orchestra, projected poetry from a wide array of sources, including librettist Korde Arrington Tuttle and Mapplethorpe’s contemporaries, fluid staging, and excellent lighting design, the performance was unapologetically arresting and provocative. “Triptych (Eye of One on Another)” explores the incredibly complicated web of emotions, relationships, and politics surrounding Mapplethorpe’s time, as his career had begun to take off in conjunction with his AIDS diagnosis in 1986 at the young age of 23. 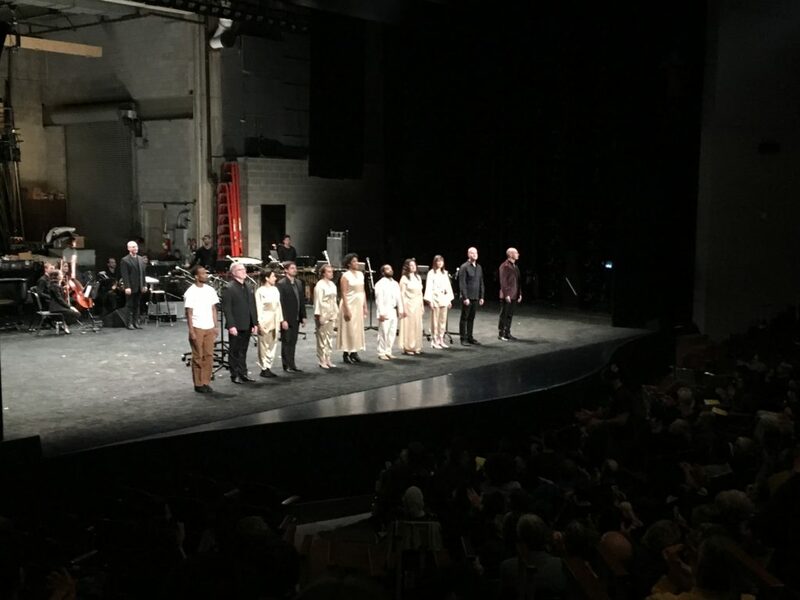 In navigating such a complicated and weighty chapter of American history, there was no singular emotional direction a work of this scope could portray, and composer Bryce Dessner fluidly swept us from the awe-inspiring cathedral, to the cold and calculating courtroom, to the intimate bedroom with a score that surged with electricity, sparkling clarity, and biting poignancy. Juxtaposed against huge projections of Mapplethorpe’s arrestingly beautiful and often disturbing photography, Dessner created a space for us to take in this controversial work, almost as if installing a very slow moving sidewalk for us to stand on while pensively moving through an art museum. A vocal ensemble that is “dedicated to reimagining the expressive potential of the human voice,“ Roomful of Teeth showcased their signature, vast timbral palette alongside singers Alicia Hall Moran and Isaiah Robinson. Over the course of the 70-minute performance, they transported us through time and space singing with the lightness of the baroque era, Tuvan throat singing, yodeling, folk singing, and other extended techniques including overtone singing. The chamber orchestra was made up largely of U-M SMTD students and alumni, who were able to pack a punch just as powerfully as they laid down immersive droning textures for the singers explore. I found that “Triptych” was a work that demanded the full attention of the audience. It put hard-edged words, music, and images front and center for all to see, without apology. Personally, I experienced an amount of discomfort in not knowing what striking or difficult image would emerge next. I longed for justice and love for people of color and people belonging to the LGBTQ+ community, and I appreciated the opportunity to be immersed in this difficult but important narrative. Roomful of Teeth will continue to take “Triptych” all around the world in their upcoming season, encouraging us all to take a moment to stop and fix our eyes on one another.